Pedestrian fatalities in Pennsylvania have steadily dropped in the past few years, but the danger of pedestrian collisions still remains a viable threat, especially in Allegheny County. On February 23, 2018, a pedestrian was the victim of a hit-and-run at the intersection of Beaver Avenue and Franklin Street in the Chateau neighborhood of Pittsburgh. And on March 19, 2018, a woman was struck and killed in Carnegie by a driver who jumped the curb. We wanted to figure out where exactly these collisions were occurring, so our firm teamed up with 1Point21 Interactive’s data analysis team to find the answer. What are the Most Dangerous Intersections for Pedestrians in Allegheny County? We also conducted a geospatial analysis of the data, mapping each incident in Allegheny County. The result is shown below. The map is interactive – use the + and – to zoom in and click on any circle to get data for that particular intersection (you can also drag the ‘person’ icon to any location for a street view of the intersection). The circle sizes represent the number of crashes – larger circles indicate a greater quantity of collisions. Below, the table shows the top 50 intersections with the highest total pedestrian crashes in the county. 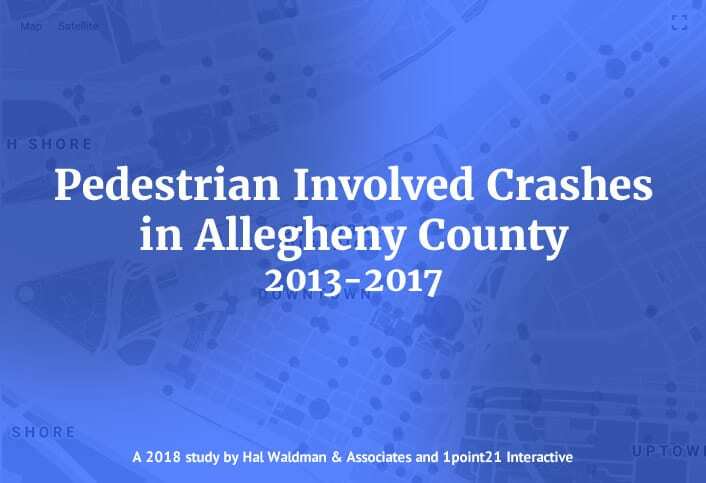 Unsurprisingly, the data indicates that the vast majority of crashes occurred in the Pittsburgh metropolitan area – accounting for over 60 percent of all pedestrian collisions in Allegheny County. This intersection, located in the Oakland neighborhood of Pittsburgh, had the highest number of pedestrian collisions on our list. This location was the site of nine collisions involving a pedestrian. Fortunately, there were no fatalities or serious injuries at this intersection, but the high number of collisions nonetheless warrants further investigation. The Oakland neighborhood in general seems to have an abnormally high amount of pedestrian collisions in Allegheny County. There are two parallel streets in this neighborhood that seem especially troublesome: 5th Avenue and Forbes Avenue. On our list of top 50 intersections, the two streets are involved in 13 total intersections, accounting for 65 total crashes, 1 fatality, and 3 serious injuries. Considered one of the city’s major cultural and business centers, Oakland is home to notable universities, museums, and hospitals, including the University of Pittsburgh, Carnegie Mellon University, the Carnegie Museum of Natural History, and the Phipps Conservatory and Botanical Gardens. The constant daily foot traffic of both tourists and residents may be the reason why there are so many pedestrian incidents in this neighborhood. According to our analysis, we found that South Side Flats was a concentrated hot spot for pedestrian collisions. The majority of the incidents are centered around State Route 387, also known as Carson Street. 6 of the 50 intersections on our list were located on this road, resulting in 26 crashes, 1 fatality, and 4 major injuries. South Side Flats is arguably the epicenter for night life among young adults, with a number of sports pubs and cocktail bars littering Carson Street. Notable intersections in South Side Flats on this road include those at S 12th Street and S 18th Street. Home to some of the most popular establishments in the neighborhood, these two intersections alone accounted for 10 pedestrian crashes. There are two intersections on State Route 837 that are notable for their close proximity to a bridge. The intersection at S 22nd Street is within a block of the Birmingham Bridge, and is the site of 5 pedestrian collisions. The intersection at the Smithfield Street Bridge seems to be considerably more dangerous, with 5 crashes, 2 major injuries, and 1 pedestrian fatality. Ross Street & 6th Adjacent to Mellon Green and Steel Plaza, this intersection contained 8 pedestrian crashes and 1 major injury. Liberty Avenue & Market Street. Right on the corner of Triangle Park, this intersection was the site of 6 collisions, 1 injury, and 1 fatality. Liberty Avenue & 9th This intersection had 4 total crashes and 2 major injuries. Grant Street & 5th Avenue. This intersection just outside of the Allegheny County Courthouse had 6 total crashes, 1 major injury, and 1 fatality. Both pedestrians and drivers can do their part to ensure safety in one of Allegheny County’s many roads and sidewalks. Avoid walking on the street whenever possible – it’s always safest to walk on a sidewalk. If no sidewalk is available, walk close to the shoulder and facing traffic. Avoid using smartphones or any other distractions when crossing the street – being aware of the road is just as important as a pedestrian as it is a driver. Avoid crossing the street when intoxicated or under the influence of drugs or alcohol. Half of all fatal pedestrian crashes involve alcohol consumption – and 34 percent of that involved consumption by the pedestrian. Be alert and on the lookout for pedestrians at all times. This is especially important if you’re driving through neighborhoods such as South Side where there’s heavy pedestrian presence and an active night life. Be mindful of crosswalks. Reduce your speed when approaching one and always yield to pedestrians. Do not pass vehicles stopped at crosswalks – they are stopped for a reason. Do not drive when intoxicated. While this tip applies to driving in general, it is especially relevant when driving in high-pedestrian neighborhoods. It can impair the reaction time, judgement, and decision-making skills necessary to prevent pedestrian accidents.